So my aquatic caries are divided in two parts. In teen years I was total absent from the world of aquarium. I don’t see nothing into what have happen in the hobby so in 2006 I was seeing very much new things in the hobby, how was new and strange for me. Many aquarists today like this in the picture type of manmade Discus. For me it was a sock to see this type Discus , first time in 2008. But it has been so much new manmade hybrids Discus how had confused me very much from 2006 to 2008. First I try to look objectivity in to them but what I seeing in behavior white this hybrids war not what I have expired in my Discus from 1971 – 1997. For me it looks like they had genetic defects and looks to have very high degenerations parameter. When I get more information about all manmade variants of aquarium fishes in the last 10 years I was away from the hobby I became very depressed in what I was seeing. It was very clearly for me this in not the type of Discus I want to work with. But I also begin to ask myself why are they making all this manmade variants, they are so ugly and have defect in the behavior. I don’t understand why someone has to destroy the native beauty in animals with a parody look of what humans made. The human wants to dominate the nature but to made clowns of native species is to scoff at the nature and the natural animal species. This is not my kind of hobby, I am an aquarist how loves the original species in the look and the natural behavior. Aquarium hobby is only a tool to study the natural life and the behavior of the fishes and not to have manmade clowns in a box in the living room. 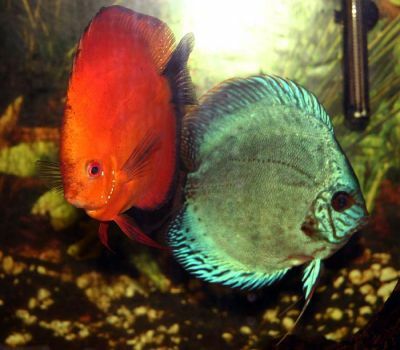 To call this manmade clowns Discus and a part of the aquarium hobby are provocation me very much. So in this site I only are going to show some of these manmade clowns only to explain what I have seen wrong with them. Primary this is a site devoted to the nature and the native tropical fishes and my experience with them. I am seeing the Mother Nature in the color, patens and body of the fishes. There natural behavior is the voice of the nature speaking to me in the aquarium. I am seeing this best in the wild catch fishes but also very much in original breed species in aquarium. All this manmade aquarium fishes pollute the aquarium shops all over the world and doing it difficult for new aquarists to see the natural look of the species in these defect manmade fishes, how are the beginning to the end for the aquarium hobby, how I have known and loved before in my lifetime. This doing me very sad and maybe I belongs to the luck last generation of aquarist how remember a time when aquarium fishes looks like they doing in the nature. The last I was read about that they now try to cross breed angelfishes to make blue angelfishes, what a stupid thing to do. It will be very petty for the new generation of aquarist to come if they only can se images of the natural species in old books; and in their aquarium is it only clown parody of the species with strange deformed forms, colors and behavior like this blue angelfish. I need a base address for my writing and publication and in 2009 I started Akvarieforeningen SortVann, Trondheim how has most of the activities around my person and my working with the hobby. For the moment it is 3 - 4 members and I think it will never be much bigger. Today, there have been 35157 visitors (90863 hits) on this page!